Favorite thing about SHPE: The people I have met in this organization are truly remarkable and inspiring. 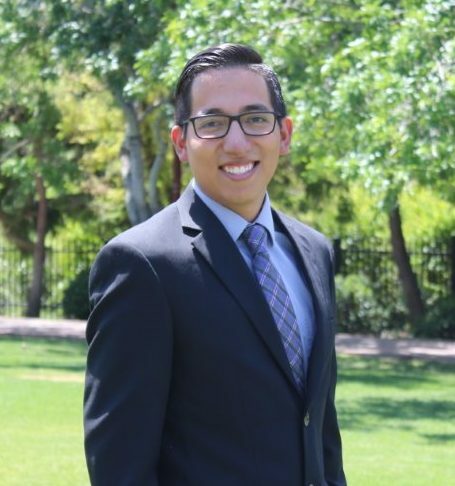 I have plenty of other reasons for being in SHPE but the support and connections I have made through SHPE are invaluable. I'm surrounded by individuals that just want see each other to grow. Fun fact: I love to move; dancing, hiking, and cycling being among my favorite forms of movement. Howdy! My name is Andrea Urueta and I am SHPE Phoenix’s new Secretary. I currently work as an electrical engineer for Honeywell Aerospace, but am originally from a little town called Del Rio, Texas. I received my bachelor’s degree in electrical engineering from Texas A&M University, where I fell in love with SHPE! I am passionate about SHPE because it encourages its members to be positive, innovative and confident. In my spare time I enjoy hiking, playing tennis, and socializing. I look forward to meeting you and hope SHPE Phoenix can be your second familia too! Favorite thing about SHPE: The people involved and the work we do for the community. Fun Fact: I don’t remember when was the last time I had a cup of coffee. I'm an Arizona State University graduate with a Bachelors of Science in Mechanical Engineering. Born and raised in Phoenix, Arizona. SHPE has been a center of inspiration, admiration, and promoter of success. The family you make within this community pushes you to be your best. For fun I like to go salsa/bachata dancing, hike, and cook. Favorite thing about SHPE: My favorite thing about SHPE is working along side amazing individuals seeking to make an impact across the Latin community. The support, friendships, and memories made with my SHPE familia is something I will always continue to value. Fun Fact: I enjoy being anything to do with art - writing, drawing, dancing, filming, editing.